Hello again- this is Meg, with the second of my guest scoops. You may remember me (or not- I’m not proud!) from my previous scoop about Caracol. 1) No photos in this post are my own. A few years ago, someone dropped a camera on one of the skulls in the cave, and as such, cameras are no longer allowed. I’ve pilfered the following images from the internet, presumably taken by visitors before the rule changed. I’ll try to give credit where credit is due, and hope the original photographers don’t mind! 2) I am a scaredy-cat. Of all the things we did on our honeymoon which made me nervous (ziplining, climbing Caana at Caracol, diving, flying in a small plane, snorkeling at Shark-Ray Alley), this was the activity that gave me the most anxiety prior to the trip. In hindsight, I’m so glad we did it- and I was surprised by the things that bothered me vs. the things that really didn’t at all. With that in mind, I’ll mention a little of each, in case you’re a wimp like me. If you’re not a wimp, this trip shouldn’t bother you in the slightest! With that said, I’ll get started. ATM is off the Western Highway near Belmopan, but it doesn’t feel all that near to the capital! We were in a group of six with our guide; the maximum group size is 8. We really appreciated the small group in the cave. We were never too far back to hear the guide’s instructions (in the trickier sections) or his explanations of what we were seeing. After a drive of about 7 miles on an unpaved road from the highway, we arrived at the parking area. Here, we had a last bathroom stop and left all non-essentials in the van with our driver. This was also the farthest cameras could go (we hadn’t bothered to bring ours that day, knowing the rule). In addition to the clothes on our backs (running shorts/capris and quick-dry running t-shirts- you need to wear more than swimwear out of respect for the site- and Keens closed-toe sandals), we brought our lunches, water, bug spray (VERY necessary!) and sunscreen in a small backpack. We also had socks, for the section of cave where you are asked to remove your shoes. The hike from the parking area to the cave entrance is about 45 mins, and almost completely flat. There are a couple of river crossings (knee- to waist-deep water, on the day we were there) and plenty of bugs, but it is not at all strenuous. Near the cave entrance, there is a picnic area where we left our lunches and other items. We gave our socks to the guide to carry in his dry bag. 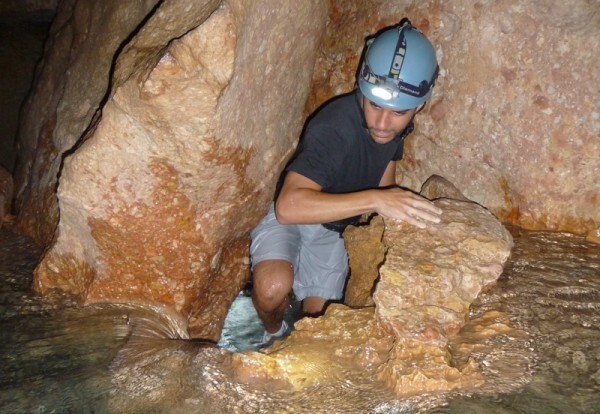 He handed out helmets and head-lamps, and we were ready to enter the cave. 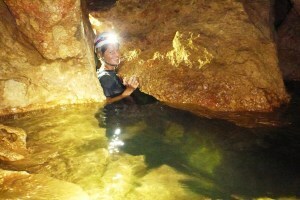 The cave entry is a watery one- specifically, we had to swim about 25 feet across water deeper than our heads. 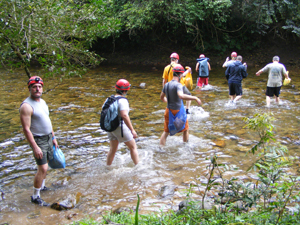 After that, most of the trip is wading through water anywhere from ankle to neck-deep. There were a couple more sections that I needed to swim, but I’m not tall (5’4’’) and the water level was extremely high (they anticipated closing the cave after the next rain storm). Actually, I preferred to swim when given the option. It’s easier to swim than it is to avoid possible shin-busting rocks! 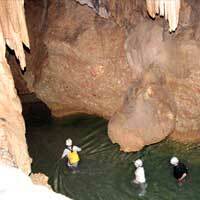 but they are short and fairly easily navigated with the help of a guide. I’d never want to do it without specific instructions! 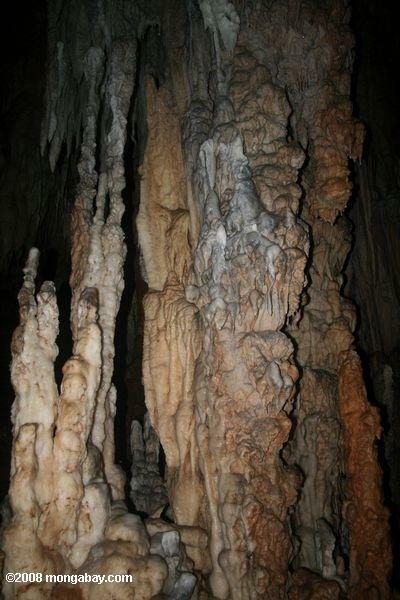 The first bit is definitely the toughest section of the wet part of the cave to navigate, and it soon opened up into caverns where we were able to see amazing rock formations- both natural and carved by the Mayans. About a mile underground, we reached the end of the wet part of our journey. Our guide explained that all the pottery, human remains, etc, are located on a shelf above us- the dry section of the cave. There was one way to reach the shelf, which is the same way the Mayans would have reached it, sacrificial gifts and lit torches in hand: a large boulder which can be used as a ladder for the 15’ climb up to the first part of the ledge. Up until this point, I’d been remarkably calm about everything, considering my scaredy-cat tendencies- but the rock climb really scared me! More than anything, my fear of “heights” is really a fear of falling; specifically, I’m ridiculously clumsy, so slipping/tripping/etc is quite likely. I’m just saying that it took a lot of convincing (mostly in my head) to get me up on the ledge- but it really would have been a let-down to give up there. The climb wasn’t physically difficult, but rather a mental challenge for me to get over. Once I was on the ledge, we climbed up a sloped area until the rock flattened out. This is where we were required to leave our shoes. 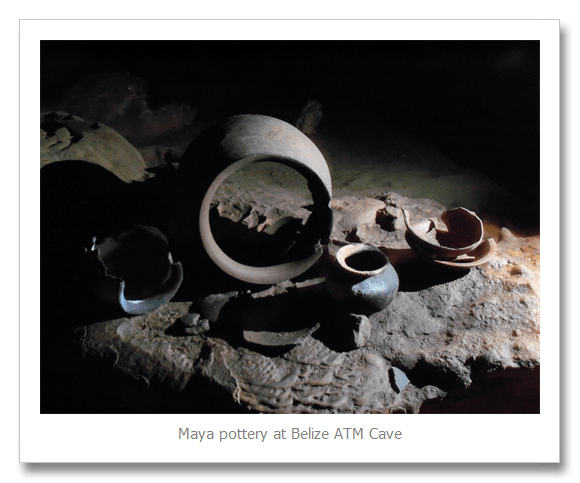 The guide explained that all the artifacts are in place where the Mayans left them- scattered across the cave floor- with only tape lines separating them from where visitors should step. People tend to be much more intentional about where they step when they’re not wearing shoes! At first, we mostly encountered pottery- some shattered, and some mostly intact with only a small hole drilled into them, rendering them useless. What really shocked me was the size of the area and the number of offerings all around- truly amazing. 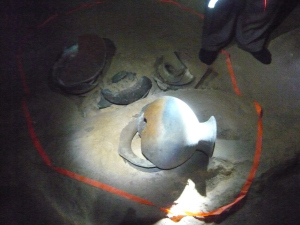 Slowly, we started to encounter more human remains and fewer pottery artifacts. 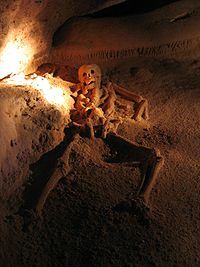 There are a total of 14 skeletons (discovered so far) in the cave. 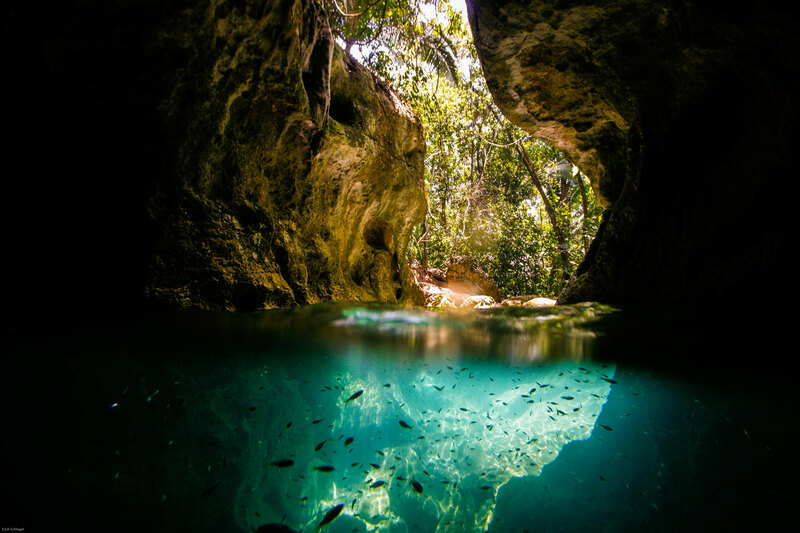 The Mayans ventured deeper into the cave and started making tougher sacrifices as times got tougher for them. Finally, we reached the “land of ouch” (so-named because of the ouch-inducing steps in stocking feet) and climbed a bit further to the base of a ladder. Oddly, the 20-foot extension ladder didn’t bother me nearly as much as the boulder climb, probably because I was certain of where to step, and the transfer from the top of the ladder to the ledge above felt much less open and exposed. Besides, at the top of the ladder was the culmination of the entire experience: the Crystal Maiden. Actually, there is some debate about whether the skeleton is male or female, but the impact is the same. It is absolutely incredible that something like this exists, and that it is possible for a layperson to visit. 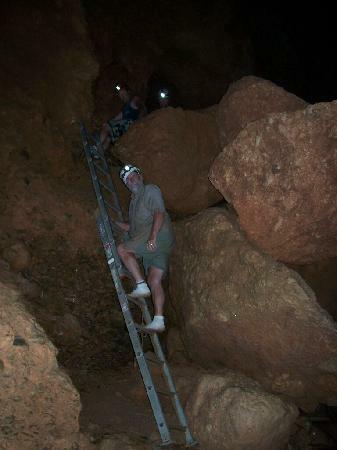 After a short time, we retraced our steps and crossed the entire dry section of the cave again. We reached our shoes, and with a generous amount of help from our guide (who basically placed my feet on each step on the way down) I made it back to the water. (I seriously could have hugged our guide at this point). 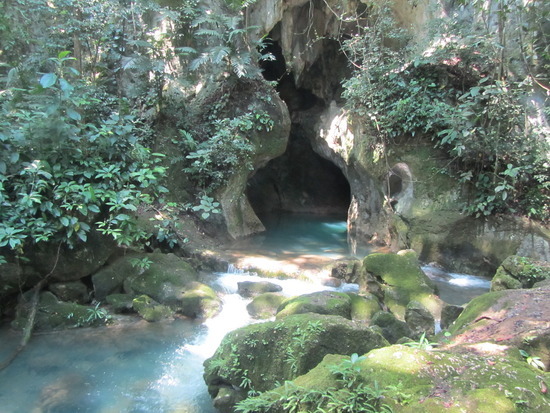 We then traveled back across the wet section of the cave, usually walking, sometimes swimming, and once easing ourselves down a natural “water slide” type of tunnel, because the way we had climbed up would have been too dangerous climbing down. We emerged back into the light bruised, wet, hungry and tired- but thrilled that we’d had such an amazing experience. We enjoyed our lunch at the picnic area, re-applied bug spray, and hiked the 45 mins out, still in our wet clothes. At the parking area, we rinsed and dried off, put on clean clothes, and hopped in the car for a reverse trip back to our respective hotels- after a stop at the grocery store so that we could toast with a couple Belikins on the road! Thanks for that great descriptive scoop! My children have done the ATM caves twice (when they allowed cameras) and described it as “life changing” to make the journey to the end. You brought the experience to life! Maybe you should be Brave Scoop since you overcame your fear! She does need a name! LIFE CHANGING? The actual scoop needs to get on this…and get over this scaredy cat crap!